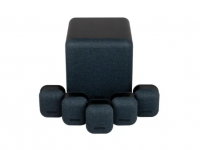 USB, iPod docks, and Bluetooth all became standard additions to these “one box” solutions with the culmination being networked hi-fi systems that cater for all non-physical formats. One such unit is the Onkyo CSN575D, which not only manages to cram all these features into a small discreet chassis but comes with speakers as well. Now, most hi-fi enthusiasts would agree that although systems including speakers make for a practical purchase, they don’t always mean you can maximise the quality of the content on offer. However, when there’s such good value on offer it’s hard to argue against it. On the rear, the banana plug speaker terminals and DAB antenna are joined by digital optical, coaxial and analogue aux inputs as well as a front mounted USB port for hard drives. Twin Wi-Fi aerials ensure a solid connection to your router but there’s also an Ethernet port for those that prefer a wired set up, allowing you to enjoy a breadth of network services such as Spotify, Tidal and Deezer as well as internet radio from TuneIn. The real icing on the cake though is the inclusion of DTS PlayFi and FireConnect multi-room services, meaning you can bring all your streaming devices together under one app. If that seems like an exhaustive list of specification for such a small bit of kit you’d be forgiven for thinking that something must have to give for this Onkyo to provide all of that at this kind of price. Thankfully though, Onkyo have enabled the CSN575D to play stored Hi-Res FLAC and WAV files up to 192 kHz/24-bit so your music can always sound at its best. We kick things off with a spin of Phantogram’s most recent album Three on CD, specifically the track “Answer”. 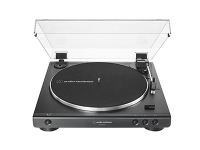 Its disjointed keys pattern and looping drums and shows that although the Onkyo only has a modest 20 watts per channel, it’s still capable of giving a reasonable sense of dynamics and scale. The tender vocals at the start of the song sit prominently but comfortably in the midrange, floating above the musical layers and laid back groove. When we choose something a little more full-on with last track “Calling All”, it’s noticeable that the included speakers will struggle a bit at high volumes when there’s a lot going on which confirms our assumptions that the CSN575D is best suited to smaller rooms. Hi-Res files in the way of breakbeat outfit Nerve’s self-titled 2017 album show that the CSN575D is capable of holding erratic drumbeats together at low to medium volumes and the added fast attack and spaciousness of the FLAC file helps the system to cope with the high demands of the arrangements. Moving on to using the DTS PlayFi app and we turn to Amazon Music, checking out some classics with Roxy Music’s “Love is the Drug”. The pulsing bass line and drums thump along with natural warmth but the CSN575D still manages to articulate the percussion with clarity. We like the PlayFi app; it’s simple but effective and adds a familiarity to the Onkyo due to it being universal and featured on other products. So there we have it, a competent all-in-one system oozing with features. If there is any criticism, it’s that the speakers are ripe for an upgrade once you’ve had the unit for a year or two. Something like the Dali Spektor range or even the stunning Monitor Audio Bronze would add a sonic uplift to this already capable product. Don’t want the hassle of picking and choosing between the myriad combinations of mini systems and speakers? 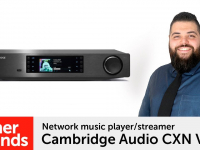 The Onkyo CSN575D should be right up your street, nip into your local Richer Sounds to give your favourite tracks a spin and see what you think.